King of Prussia, PA – Merion Drive in Concord Township, Delaware County, will close between Marlborough Lane and U.S. 322 (Conchester Highway) for approximately two months beginning Monday, March 25, to allow crews to complete widening and other improvements on the eastbound side of U.S. 322 (Conchester Highway), the Pennsylvania Department of Transportation (PennDOT) announced today. During the closure, which will be put in place the morning of Monday, March 25, motorists will be detoured on Marlborough Lane, Cambridge Drive and U.S. 322 (Conchester Highway). Residents will continue to have access to properties on Merion Drive up to the intersection. 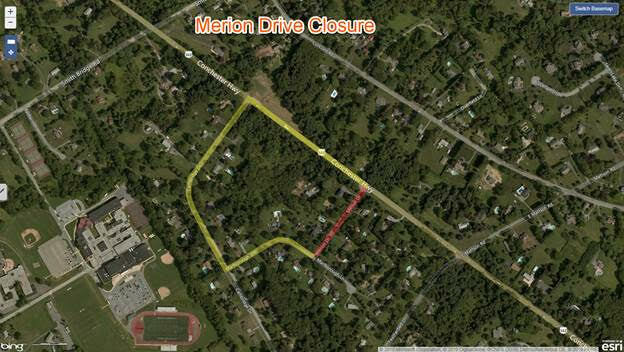 The closure will allow PennDOT’s contractor to finish improvements to the intersection of Merion Drive and U.S. 322 (Conchester Highway) and complete construction of two new eastbound lanes between Fellowship Drive and Clayton Park Drive by early summer. Eastbound construction between U.S. 1 (Baltimore Pike) and Fellowship Drive finished in January. A lane of eastbound and westbound traffic was then shifted onto the new eastbound lanes, allowing westbound construction (Stage 2) to start on the western half of the project area. Completing eastbound work east of Fellowship Drive this summer will allow PennDOT to place all work zone traffic onto the new eastbound lanes and expand westbound, Stage 2 construction across the entire 2.5-mile work area. The widening and other improvements are being done under PennDOT’s $62.6 million Section 101 contract that began in spring 2017 to reconstruct, widen and upgrade traffic signals and intersections on U.S. 322 (Conchester Highway) from U.S 1 (Baltimore Pike) to just east of Featherbed Lane/Mattson Road near Clayton Park in Concord Township, Delaware County. Motorists on U.S. 322 (Conchester Highway) and some intersecting streets in the work area will continue to encounter periodic flagger-controlled lane closures and brief stoppages on Mondays to Fridays between 9:00 AM and 3:00 PM through the end of the year. Current construction is the first-of-two mainline projects to widen, reconstruct and improve mobility and safety along a 6.7-mile section of U.S. 322 (Conchester Highway) from U.S. 1 (Baltimore Pike) to just east of Route 452 (Market Street) in Concord, Bethel and Upper Chichester townships, Delaware County. Work on the first mainline section is scheduled to be completed in late 2020. Engineering design is advancing for the widening, reconstruction and other improvements on U.S. 322 (Conchester Highway) from Clayton Park Drive to east of Route 452 (Market Street). Construction on this section (Section 102) is expected to start in late 2020.